After my last video it was noted that I had left out 1 option to recover from a power outage and recover my X,Y,Z original positon. I had not covered this option for a couple of reasons. Using the offset between Machine coordinates and Working coordinates you can recover your position. It has long been used by machinists who have homing switches on their machines to restart the next day and take up from where they left off. Brilliant! I hear you say, but this method has always had a fatal flaw and to the best of my knowledge no cure. The offset is not saved unless the PC is shutdown correctly. If the power goes off in mid cut the offset values are lost. Jerry Rutherford from "askjerry" Youtube channel, did a video response to my last video and explained the offset priciple and how it can recover position if the machine is shut down correctly. He also showed that if it is not shutdown properly how this position is lost. Jerry is using LinuxCNC but the principle of operation is the same. I don't know if this is not well known but I haven't heard anyone mention this feature and given how with the push of a button you could save your work from ruin I'm surprised I haven't come across it before. This method really suits those who have homing switches installed on their machines. Combine automatic homing with the Offset save feature and you can have a fast accurate method to reset your cutter back to your work. The accuracy of such a setup is only as good as the accuracy of the homing switches. If you cannot get repeatible results then you need to look at your homing switch setup. While the video demonstrates that it works and works well in reality it will probably only get used in large jobs simply because of basic human nature. In the past expressed the opinion that limit and homing switches are not "needed". I stand by that opinion however, this is the first time I have seen a feature that adding these switches to my machine would give me that I consider worth having. While I will not be rushing out to install them at this time I will think about adding them at a later date. Please do not think that I am anti limit switch because I'm not. Up until now I haven't seen anything that they will do for me that interests. That isn't to say that I wouldn't use that if I had them. Most likely I would probably enjoy having them but there is a difference between Need and Want. Thanks Jerry for making this video and testing other options. Here is Jerrys video explaining how the offsets work and he demonstrates how to do it using a leadscrew machine. 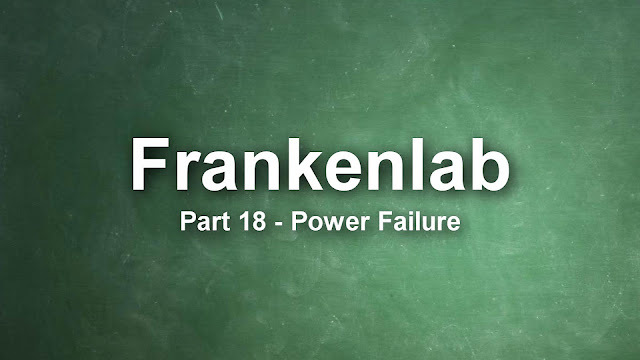 His Frankenlab series is well worth watching and don't forget to check out the Awesome laser he has for his machine. 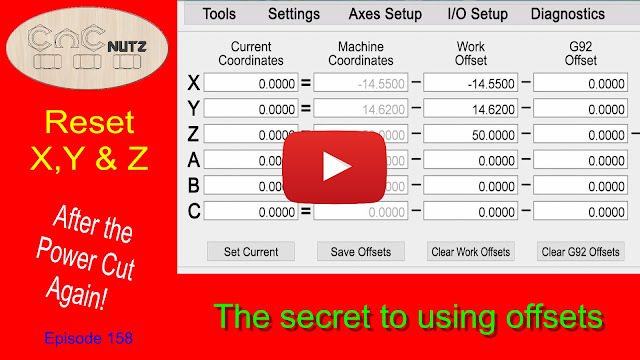 I don't know if there is an option to do this or not but i would like to see offsets automatically saved everytime your X,Y or Z working coordinate is changed with the zero button. This will then ensure that a recovery is always an option if you have homing switches installed. Maybe a macro will do this, but I will have to leave this to people much smarter than myself. Thank you for taking the time to read this and I will catch you next time. Very good explanation. I have a HB04 pendent with my UCCNC software and have the Macro 7 button set to "Save all offsets values to the Profile" which is function # 156 in the ini file. It Makes it really easy to set up the job, press macro 7 and I know the offsets are safe in the even of a power outage. On your final thoughts, It would be possible to write a macro in UCCNC that would zero the work coordinates and save the offsets, and set that macro as a single button on the pendant.